We also found this. 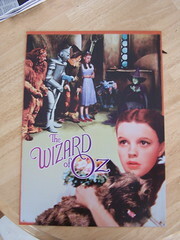 We like the old Wizard of Oz stuff. If anyone knows where to get a set of fake ruby slippers, let us know. Here’s our big “score” from yesterdays flea market trip with Jonna’s family. This is a poster made of tin. This was actually our first trip to a flea market and I rather enjoyed it. It was fun to see some of the stuff that they have on sale there and amazing to see the things that people actually keep. We got pictures of some of the stuff that I have posted to the photo album. This entry was posted in General and tagged Photos by Ron Bieber. Bookmark the permalink.